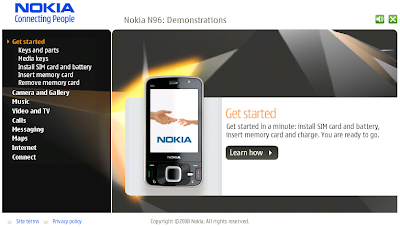 The Nokia N96 which is similar to the N95 has finally launched its own special Flash-based web-tour. It goes into all the details regarding GPS, music playback, and Internet browsing. The Flash demonstration site allows you to see how the menus and other features of the phone will work as well as look at cool features such as watching live TV and video podcasts. This is supposed to be the new turbocharge replacement for N95 but so far i dont see much of a huge improvement over its predecessor. Perhaps I would have to wait till the phone is out before i make any further critical comments. Below is a short video clip on the features of the new N96 thats scheduled to be launched in the 3rd quarter. Great stuff...I very much enjoy your perspective combining China and Nokia. I've added you to my blog roll. hi paul, thanks for your compliment. I had been a loyal follower of your blog and had also added you to my blogroll too.